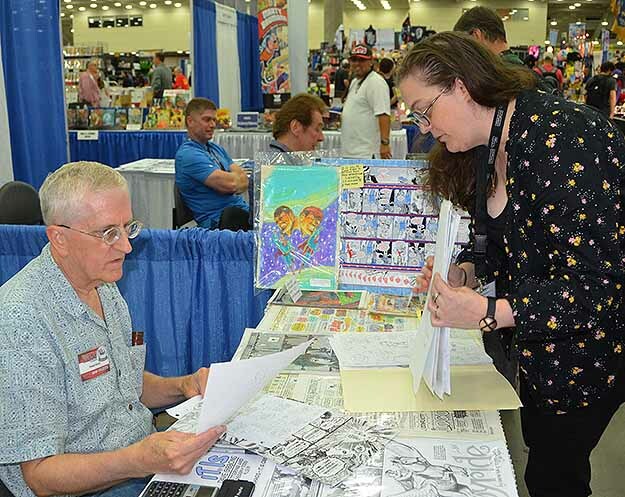 At this year’s Baltimore Comic-Con, I was surprised by a visit from writer/artist Carla Speed McNeil and delighted with what she had decided to give me, a page of her original art as well as her layout and lettering guide. Carla’s process is unusual, and I found it fascinating. I told her I’d write about it on my blog, and here it is. This and all following images © Carla Speed McNeil. As you can see, the art includes lots of distinctive lettering in a variety of sizes and styles. 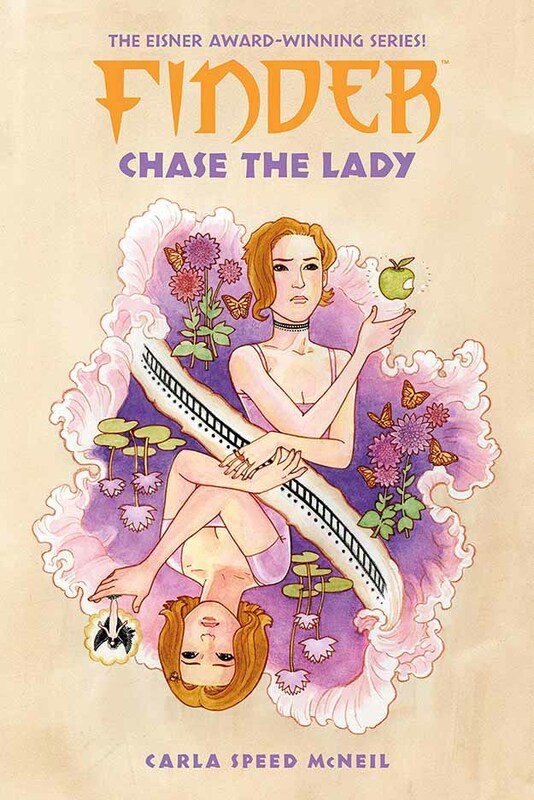 I like both the art and the lettering a lot. Detailed but clear storytelling and full of energy. The size of this page, on which the art runs right to the edges, is 9.5 by 14 inches. Carla begins work with a layout on a sheet of copy paper almost the same size, 8.5 by 14 inches, or legal size paper. This is done in pencil, and some areas are quite detailed while others are looser. The lettering is pencilled at roughly the shape and size she wants it. Carla will put this layout on a light box under her art paper to create the final inked art, but the lettering goes through an additional step. Carla first works on the lettering in pencil on a separate piece of thin graph paper, using the horizontal lines to keep things straight. 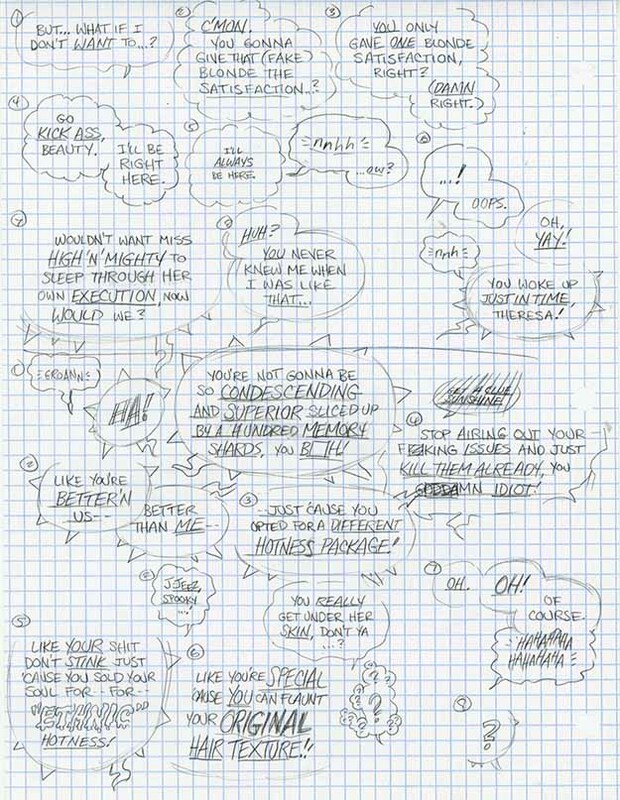 “I tried using the Ames guide,” she told me, “but this works better for me.” It actually reminds me of the art paper some comics artists have used in the past with pre-ruled horizontal lettering guidelines in pale blue ink,, and letterer John Workman sometimes uses a pre-ruled sheet of paper with guidelines on it in a similar way behind art he’s lettering by hand, so it’s not a new idea. 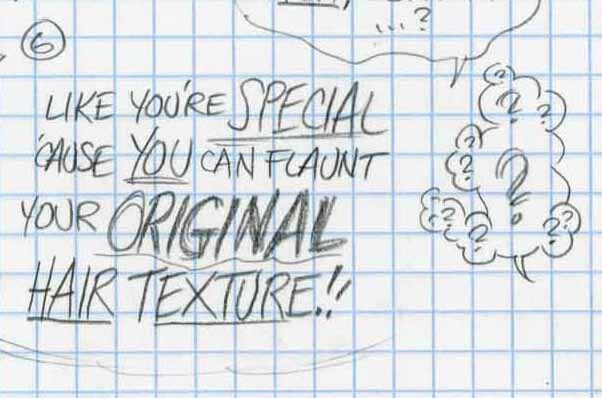 One advantage of doing it on graph paper as Carla does is that she can reposition each piece of lettering as needed before inking it on the art. All the ideas are here, the finesse comes in the inking. Since I can’t show the full art page very detailed on this blog, let’s look at two individual panels. 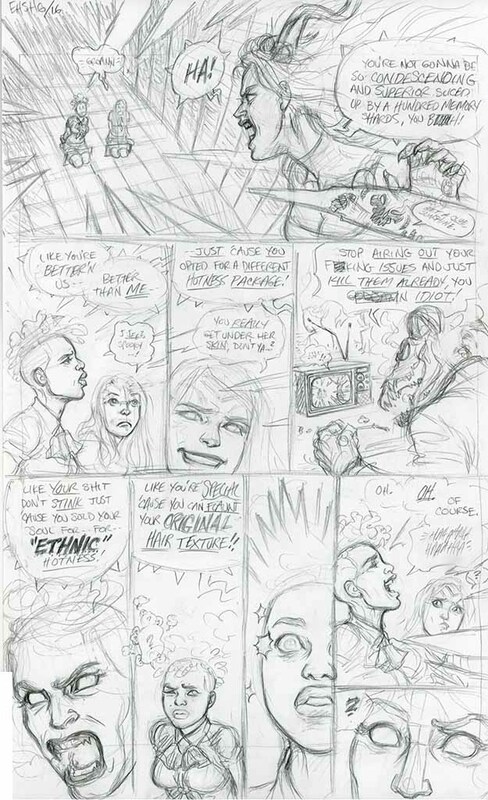 Here’s the layout for panel 6 with a large off-panel balloon and a cool collection of question marks. 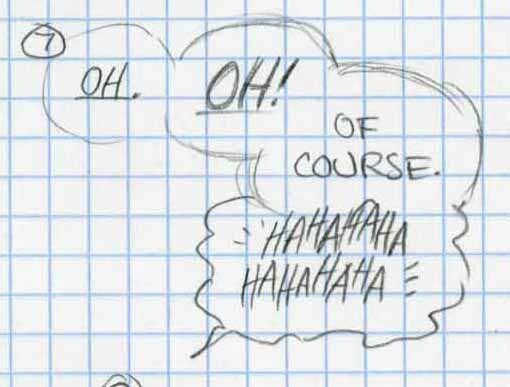 The lettering layout is pretty close to the art layout, but a little more carefully aligned on the graph paper, and the question marks are worked out better. Here’s the art layout for panel 8 with four connected balloons and a small single one. 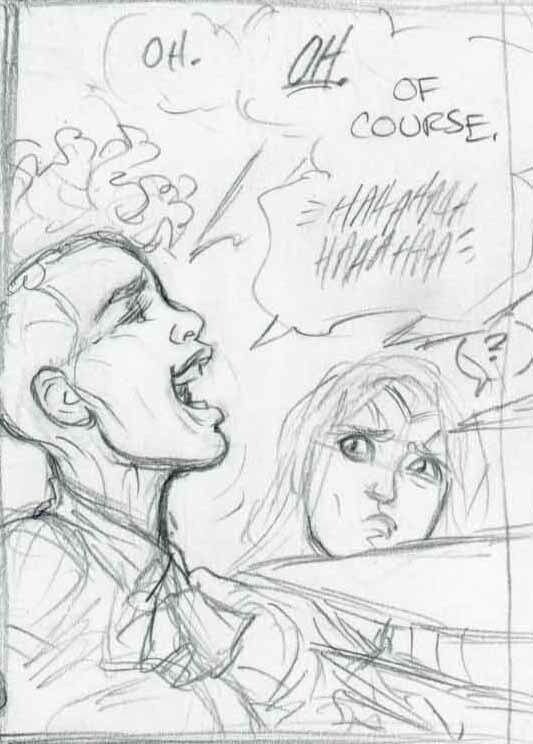 The lettering layout allows Carla to keep things aligned, but still bouncy where she wants that, as in the HAHAs. The final art is similar, but with size and emphasis worked out in ink. 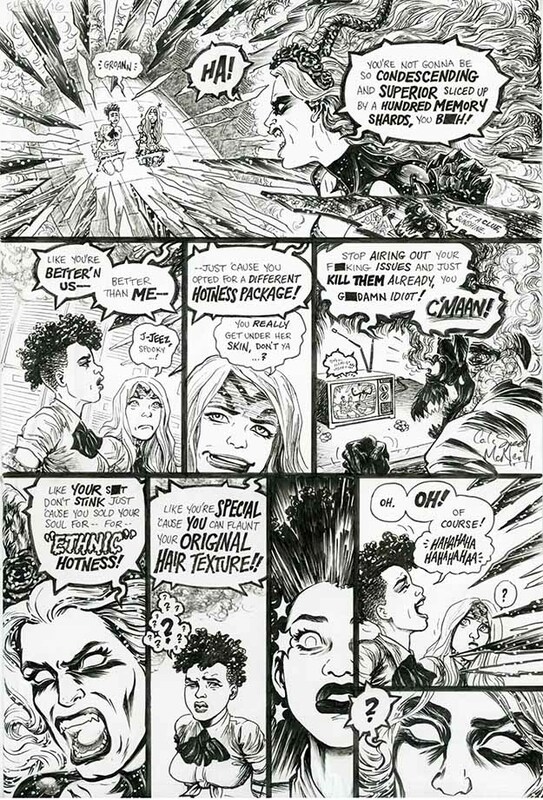 There are plenty of other examples on the page that add variety and interest to both the lettering and the work as a whole. Thanks again to Carla for the insight into her process. It was fun to learn about it, and I appreciate the gift! She is super-talented. “Finder” is one of my all-time favorites. That was a nice look at her lettering process. 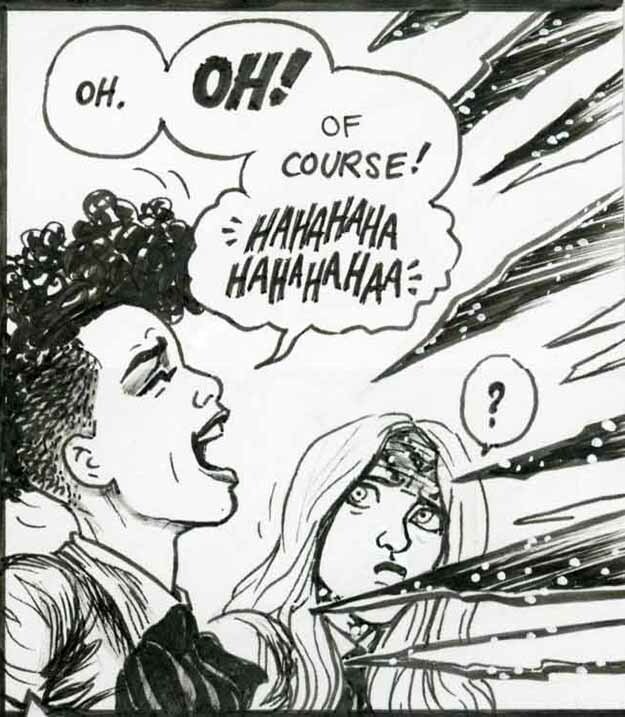 I’ve certainly noticed that she really pays extra attention to her lettering as I read her “Empowered” mini-series. I think Carla decided to do this after webcomics writer Jim Dougan stopped over to show her your poster of comic book lettering. It’s always interesting to see how this connections play out.